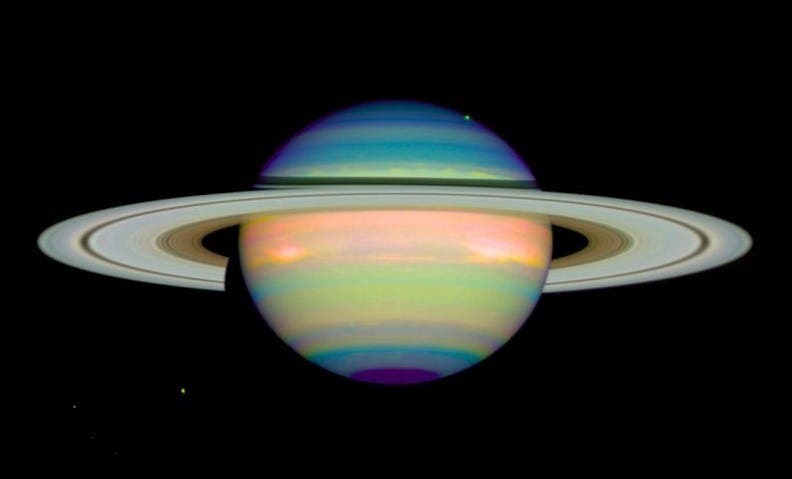 Today, April 3rd, Saturn will be "at opposition"–opposite the sun in the skies of Earth. Whenever this event occurs, Saturn's rings surge in brightness, due to the Seeliger effect, also known as the opposition effect. Saturn's rings are made of water ice, with some contamination from dust and other chemicals, ranging in size from dust to objects as high as the Rocky Mountains. Sunlight directly backscattered from those ice particles causes the ring system to shine with greater intensity for the few days around opposition. Saturn can be sighted with the naked eye at midnight; look for a conspicuous yellow "star" in the constellation Virgo. A small telescope will allow you to observe Saturn's brightening rings. What you won't see tonight, however, is Saturn's enormous outer ring. "The volume of the ring is such that you could fit a billion earths inside of it," said Dr. Anne Verbiscer from the Department of Astronomy at the University of Virginia, one of the discoverers of the enormous outer ring. "So that to me is just almost incomprehensible. It's so large, but yet if you were standing in the middle of the ring you wouldn't even know it.. It's extremely tenuous and there are only about 20 particles, 20 grains, of this dust from this moon in a cubic kilometer so that's almost non existent, but then there it is." 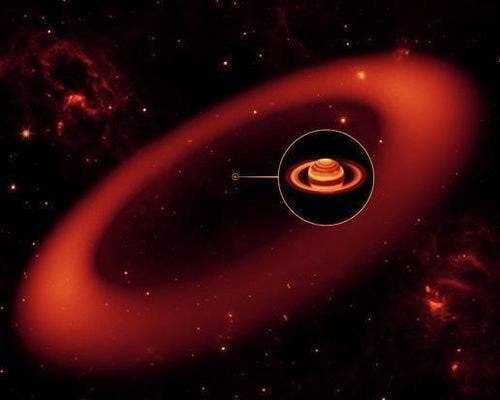 NASA's Spitzer Space Telescope recently discovered an enormous ring around Saturn — by far the largest of the giant planet's many rings. The belt lies at the far reaches of the Saturnian system, with an orbit tilted 27 degrees from the main ring plane. The bulk of its material starts about six million kilometers (3.7 million miles) away from the planet and extends outward roughly another 12 million kilometers (7.4 million miles). One of Saturn's farthest moons, Phoebe, circles within the newly discovered ring, and is likely the source of its material. Saturn's newest halo is thick, too — its vertical height is about 20 times the diameter of the planet. It would take about one billion Earths stacked together to fill the ring. "This is one supersized ring," said Verbiscer. "If you could see the ring, it would span the width of two full moons' worth of sky, one on either side of Saturn." These observations were made before Spitzer ran out of coolant last May and began its "warm" mission. One of the solar system's most evocative mysteries — the origin of Saturn's rings — may have been created by an unnamed moon of Saturn that disappeared about 4.5 billion years ago in a forced plunge into Saturn leaving behind the planet's spectacular and rings. As the doomed moon made its death spiral, Saturn robbed its outer layer of ice, which then formed rings, according to a new theory. "Saturn was an accomplice and that produced the rings," says Robin Canup, an astronomer at the Southwest Research Institute in Boulder, Colo. If the rings were formed by a moon-on-moon crash or an asteroid-on-moon, there would be more rocks in the rings. "Something had to have stripped away the outer ice of a large moon," Canup said. Billions of years ago when the planets' moons were forming a large disk of hydrogen gas circled Saturn and that helped both create and destroy moons. Large inner moons probably made regular plunges into the planet, sucked in by the disk of gas. These death spirals took about 10,000 years, during which Saturn stripped the ice away from a huge moon while it was far enough from the planet that the ice would be trapped in a ring. According to Canup's model, the original rings were 10 to 100 times larger than they are now, but over time the ice in the outer rings has coalesced into some of Saturn's tiny inner moons, which explain Tethys, an odd inner moon that didn't quite fit other moon formation theories, she said. But this doesn't explain rings on other planets in our solar system, such as Jupiter, Neptune and Uranus, which probably formed in a different way, Canup added. The rings and ice-rich inner moons are the last surviving remnants of this lost moon, "which is pretty neat," Canup said. Saturn's rings have been studied for the last six years by a school bus–sized spacecraft named Cassini that has been sending back astonishing pictures of the rings and the moons that help shape them. In August 2009, the rings were thrown into high relief, literally, during Saturn's vernal equinox. As the sun crossed into the northern hemisphere, its rays shone parallel to the rings for about four days—an alignment that happens once every 15 years or so. And as the rings themselves slipped into shadow, previously unseen features revealed themselves. The equinox enabled Cassini to capture sharp relief images of the incredible rings around Saturn with the Sun shining sideway-on (when you're in space you're really at the mercy of natural lighting). The results were amazing: rings thought to be ten meters thick, with variations of two stories at most, turned out to have vertical jumps the size of the Rocky mountains. The thing about space is you can hide things that big in it. The results captured during the week of perfect plane illumination will be studied for years to come, and the great thing about the internet age is that they aren't just for the professionals – they stitched together a truly mind-boggling high resolution image just for us online-types to goggle at. "It's like standing outside right before the sun sets. Your shadow gets very long. Anything that's a little bit bigger, or sticks up, casts a shadow," said JPL's Linda Spilker, Cassini's project scientist. The shadows revealed curtains of ice particles up to four kilometers tall, created by Daphnis, one of Saturn's moons. Daphnis orbits at a slight tilt with respect to the rings, and when it crosses the ring plane, it drags some of the ring material after itself. Carolyn Porco, head of the Cassini imaging team. If the resonant moon's orbit is slightly askew, three-dimensional bending waves—also spirals—form as well. The density waves and the bending waves propagate in opposite directions, says Spilker, adding a further level of complexity to the rings' structure. The equinox images also revealed a new kind of three-dimensional wave, only about 100 meters tall. "From high above, the rippled surface of Saturn's D ring looks like a corrugated roof," says Spilker. "The ripple extends for more than 17,000 kilometers across the ring system. When the Voyagers flew by, it wasn't there." Scientists remain baffled about the ripple's origin, but one possible scenario has a meteoroid slamming into the rings. Casey Kazan via NASA , Spitzer Space Telescope, Jet Propulsion Laboratory.